One of the privileges of being a poet is getting to know the poets whose work you love as people. These are connections formed on many layers: how you know them as poets, as friends, as lovers, as contemporaries, as critics, as travel companions and sometimes as foes. Two of these three friends of mine who are poets (or maybe poets who are friends of mine) have new books out. The third has a not-so-new book going into its second printing shortly. I’m one of those people who just rave about the things they love (you may have noticed, if you’ve been following my blogavatars for some time). So here are some favours for them as a friend, and some word-of-mouth as a fan. Indran is a mentor, in some ways. He’s writing the foreword for my forthcoming book, after all. That doesn’t mean you shouldn’t trust my opinion of his work: you only have to ask him to know that I have disagreed with some of his word choices, syntax, punctuation, whole poems — just as he has with mine. What most struck me about this book of poems, written in the aftermath of the Asian tsunami of 2004 and focusing on its impact on Sri Lanka, was the attention to detail. Not just circumstancial description, but mainly emotional mapping of a subtle yet distinct variety. A substantial number of the poems adopt a persona, an eyewitness view, and there are moments at which the poet convinces the reader totally of having had the experience. The poet himself was in the United States at the time of the disaster, but you would never be able to tell, were it not for this admission in his introduction to the book. 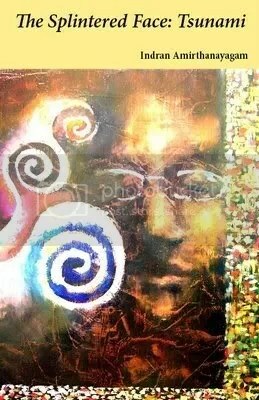 The Splintered Face: Tsunami Poems was published by Hanging Loose Press, New York in January 2008. You can buy it online from Amazon, among other places, as well as from the publisher itself. removed for questions of hygiene. I first met Pooja at the KL Literary Festival in March 2007, where we “sparred” at a poetry slam. I was captured by her warmth and her gutsiness. We spent some time together when I was in Singapore last month, and I am hugely proud that she’s brought out this honest, sassy book. I’m not the first person to say it, but she’s a ray of sunshine amidst the generally excellent but rather sombre contemporary poetry of Singapore. 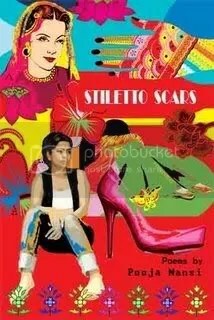 Stilleto Scars was published by WordForward, Singapore in December 2007. Give the gift of power. Show that appearances are more important than reality. you look invincible in all your glory. Reveal all that has been hidden deep inside. quashed by the lazy wandering of easy flat planes. that you are a tool and a weapon all at once. Lead hearts on to dance floors. Yi-Sheng and I met last month at the Singapore Writers’ Fest ival. I was blown away by his performance poetry, and flattered that he remembered having seen a copy of my chapbook at Books Actually some months before. Yi-Sheng is really something to behold onstage. He brings across both quiet, emotive poems and loud, performative ones so convincingly — and is equally impressive on the page. I was so enamoured of the copy of Last Boy that he gave me that when we met for supper (crocodile meat in Geylang — and sad to say, it does taste just like chicken), I kept associating things he said with the poems in it. Only later did I think that in his place, I would have been weirded out. Most impressive about this book is Ng’s wide range of inspirations and images: from history to anatomy to mathematics and more, his poems are layered with knowledge — meaningfully. 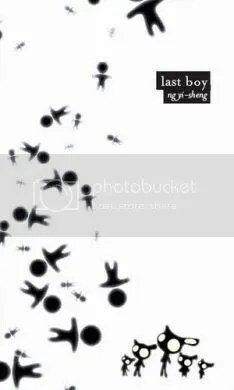 Last Boy was published by Firstfruits, Singapore in 2006, and will be reprinted soon. You can buy it online from the publisher. at the lake, waiting for rescue. and will not save her, even when flames lick her thighs. and the swans are inside her. to break out in feathers, stiff as paper.